Dynamics Telephony works with Busylight from Kuando to show your status to your colleagues and supervisors. This translates in to more efficiency for agents, and a faster response to traffic overloads in your call center. When there are calls waiting, a supervisor can now quickly see and directly speak to agents that are LOGGED OUT or NOT READY. 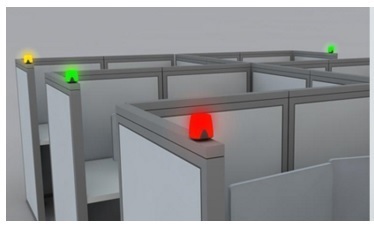 The busylight at the agents desk gives the supervisor all the information they need to see who might respond to the waiting customer. For agent efficiency, remember, “”It can take 20 minutes to regain full focus after an interruption”. this is partticularily true in Outbound calling operations. Dynamics Telephony will keep interruptions away for the full duration of your call – preview, talk and wrap time. Because Dynamics Telephony is compatible with any phone system, the Busylight integration we provide also works with any phone system, including Avaya, Cisco, Skype for business, Asterisk, SIP systems and any TAPI based system. Your data never leaves CRM – no more export/import with a dialer – excellent data security. Automatically manage no-answers, callbacks, bad numbers etc. There are two broad ways you might like to operate your list processing – one list per agent or shared lists between groups of agents. Dynamics Telephony can operate in both of thee modes. For one list per agent, simply use the built-in “Private Queue” feature of Dynamics CRM and Dynamics Telephony will distribute that list to the agent to process in the Dynamics Telephony Progressive Dialer. Alternatively, for shared lists, you add the list to a Dynamics CRM Queue, and assign agents as members of the queue, and Dynamics Telephony will feed the queue items to the member agents, to process using the Progressive Dialer. The system will feel very familiar to you as it leverages a set of standard Dynamics CRM features into one seamless phone-call campaign solution, for seriously smooth campaigns. For building your calling lists in the first place, you can use Advanced Find, Campaigns, Quick Campaigns, Marketing Lists, file import, ad-hoc or workflow. For assigning lists to agents, or groups of agents, use the standard features of Dynamics CRM Queues. Then for managing and monitoring the campaigns you can use the features of CRM Queues to turn on/off lists, or move agents between Queues. And as usual, if the standard features are not enough, you can use the customisation features of CRM, such as Workflows and Dialogs, to further enhance the system. Your data never leaves CRM. So for zero data management pain, and data security, Dynamics Telephony is your preferred telephony option. Dynamics Telephony and its Progressive Dialer is built right in to Dynamics CRM. This means that your customer data never has to be exported to the dialer, be it cloud based or on premises. 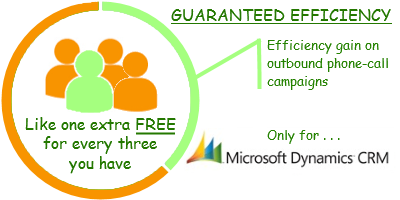 Dynamics Telephony simply accesses the data in CRM and save outcomes and statistics in CRM too. Once the call is over, the agent will select an outcome from the set of outcomes you have configured. The chosen outcome allows you to report on the many outcomes you are interested in. So you can set up the outcomes to capture the data you need. As well as that, the chosen outcome is configured to mark the call as completed, or automatically schedule a follow up. For more advanced scenarios, you can set up a workflow to trigger off the outcome. this might, for example, send a guide to a prospect and schedule a follow up call in 3 days. We’ve been supplying Progressive Dialers for nearly 20 years, so we know a thing or two about the features that are important to users. You will find them all in Dynamics Telephony Progressive Dialer. Features such as no-answer and busy retry, callback management, scheduled callbacks, configurable outcome buttons, wrap time, preview time, pause dialer, statistics and much more are all available out-of-the-box. Dynamics Telephony Dialer is a progressive dialer embedded in Microsoft Dynamics CRM. This results in efficiency gains available with no other dialer. The gains are like getting an extra agent for every three you already have. Imagine all the extra sales that could mean! Part of Dynamics CRM, yielding fastest agent training. No need for data export/import with and external dialer. Integrated reports in CRM – less time to create. Sure of Ofcom or FCC compliance.